StopTech Trophy Big Brake Kits are bred for racing. They include forged, lightweight StopTech STR calipers, floating, slotted AeroRotors, stainless steel brake lines, and race engineered caliper brackets. Easily identifiable by their unique shape and finish, StopTech Trophy Big Brake Kit components feature a MIL-spec hard-anodizing on the Trophy STR calipers and AeroHats that is impervious to color change or fading at extreme race temperatures. StopTech Trophy Kits feature ultra-high performance STR lightweight forged calipers in six-piston, four-piston or two-piston configurations. Based on the highly praised StopTech ST-60, ST-40, and ST-22 calipers, STR calipers feature the same metallurgy and design, but are engineered to provide up to a 20-percent reduction in weight without sacrificing stiffness or performance. 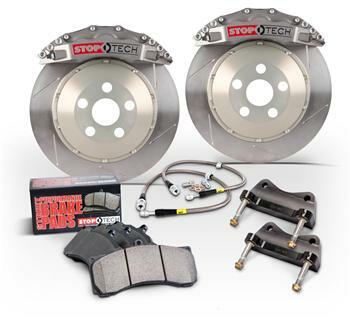 There are two types of StopTech Trophy Big Brake Kits available – one for the track and the other for the street. Designed specifically for motorsports competition and dedicated track cars. Unique to the Trophy Race Big Brake System is full-floating mounting hardware, which eliminates pad knock-back, and the elimination of the dust boots in the caliper. Together, these technologies optimize the brake system to provide improved performance and consistent pedal feedback under the unique combination of hard cornering and braking found on the track. Trophy Race Big Brake Kits are the ultimate in racing performance, with numerous wins and championships in World Challenge, Grand-Am, NASA and SCCA racing. Intended for ultra-high performance street use. They are designed for street driven production vehicles. The Trophy Sport Big Brake Kits use the same STR calipers, AeroRotors and AeroHats found in the full-race Trophy Kits, but add silicone dust boots for extended service intervals and anti-rattle rotor mounting hardware for quieter operation. They also include StopTech Street Performance Brake Pads for high performance street and occasional track use. Trophy Sport Big Brake Kits are the ultimate street braking system. Any StopTech Brake Kit can be ordered as a Trophy Race or Trophy Sport(street) kit simply by specifying it on your order. StopTech has developed several design innovations to improve rotor airflow. The patented 2-piece AeroRotors push more air thanks to curved, airfoil-shaped vanes and an air channel that widens at the trailing edge of the vanes. Application-specific hardware that is stronger than most competitors, with studs instead of the more commonly used bolts and hard anodized aluminum billet composition. Braided stainless steel lines reduce system compliance and improve brake pedal feel and modulation. StopTech’s Stainless Steel Brake Lines are D.O.T. compliant and designed to fit your vehicle.